In a break with the usual format, The Armchair Adventurers are at risk of disappearing up their own fundament. It’s too short to break in two, too long to listen in one go, so disappointing either way. Take your time, pause a little, as you listen to the blow by blow account of our big day out. It’s 30 years since we last went to a Games Convention. We went to Dragonmeet ’15 in December, this is a reflection on what we did when we were there and how things have changed in gaming in the meantime. This introduction includes a A brief potted history of Dragonmeet, with extra bits of information provided by Modiphius. The morning of the day before, Judge Blythy joins Dirk as we plan the trip and reminisce about Games Cons of the past. Everything comes back to White Dwarf and it’s coverage of Games Conventions back in the day were our way of enjoying them vicariously. There’s a quote from Scott Dorwood who reviewed the podcast. Some general reflections on our observations while we were there as well as a blow by blow account of some of the experiences we had. 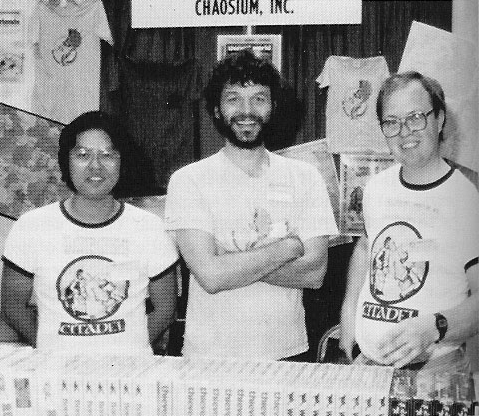 How the market has changed, stuff we bought, and the apparent controversy around the benign Chaosium seminar. We attend seminars featuring Ken and Robin Talk Quickly About Stuff and the “Is there too much Cthulhu” debate between The Good Friends … and The Smart Party. While we were there, we interviewed Mike Cule, star of the stage and screen, and the author of RUMBLE AT THE TIN INN (amongst others) and one of the hosts of Improvised Radio Theatre with Dice. Eddy, the resident bargain-hunter in chief, shares his Dragonmeet haul and takes on the 20 quid challenge. Listeners share their convention experiences. Normal service will be resumed next time when we discuss STORMBRINGER. I thank you for the ego-boo and commiserate with you and Blithy for your con-going experiences. I too had the idea (I had it twice! And I was old enough to know better) of travelling overnight and arriving bright and refreshed at the next day’s event. The first time I made the mistake of choosing the night before the England/Scotland match to travel down to London from Nottingham and found the train full of Scotland supporters. The second (going up to Scotland for a World SF con) I found myself sharing the compartment with two drunken squaddies and their wives. I too have found myself wandering around with little to do at cons of all sorts: there seems to be a huge element of luck involved in finding things to do between the scheduled events no matter how well you plan your time. Me, I’ll be at Summer Stabcon in July (and that’s near enough to you, I hope) and at Continuum in August (celebrating my birthday there this year in fact). I might make a Concrete Cow this year. Or I might not. I’ll make a note of the site and Stabcon. It’s in Stockport which is very near to us, but we’ve not been because it sounds very mysterious. The details are on a ‘need to know’ business aren’t they? You’ll have to keep me informed about how your NBA campaign comes along.I’m doing the work at the moment for the first game in a couple of months. I’m thinking of starting with scenarios from the Zalozhniy Quartet before moving into The Dracula Dossier… I’m excited by it, but the whole thing seems very daunting. It’s not so much mysterious as badly publicised. The attendance is up about as far as the hotel can take and the organisers don’t feel like pushing to find a bigger one or running a bigger con. We do get new people coming along every time so don’t let that discourage you. STABCON describes itself as a games club that only meets twice a year. January and July we take over a rather shabby hotel and play games from Friday afternoon to Sunday afternoon. There’s always a good number of RPGs going on from DnD campaigns that are decades old to me trying out a new indie game. And there are a metric ton of boardgames new and old, famous and obscure being played. FanBoy3 turn up and sell games. The food is adequate rather than wonderful and the beer is good (at least until the bottled real ale runs out). NBA is well along. I started them off with (S)Entries from the core book and then THE ZALOZHINY QUARTET. They are busy running away from the Russian mafiya and may be about to regret saving nearly a dozen trafficked women while in Romania. No Good Deed Goes Unpunished. Great episode, one of my favorites so far…. especially your interview with the marvellous Mr Cule. Couldn’t resist checking out IMDB, especially impressed with his Max Headroom and A Very Peculiar Practice credentials. Looking forward to checking out the Stormbringer Episode. Do you think Ringworld could be on the cards? Thanks Andrew! We weren’t sure about this one because it seemed a bit indulgent and lacked the focus of some of the others. Pleased you liked the interview with +John Michael Cule too – he’s brimming with gaming wisdom. The Stormbringer episode is coming together and should be out in the next three weeks (if I can trap Blythy in a room long enough). As for Ringworld … Well, later in the year we’re going to give listeners the opportunity to nominate games to be covered, so it may join the list. We want to get some of our most played games out of the way first. Thanks for listening and supporting!